Glass gems can be found at craft stores and big box stores. For a more recognizable apple, I went with red gems but remember there are also yellow and green apples, too! 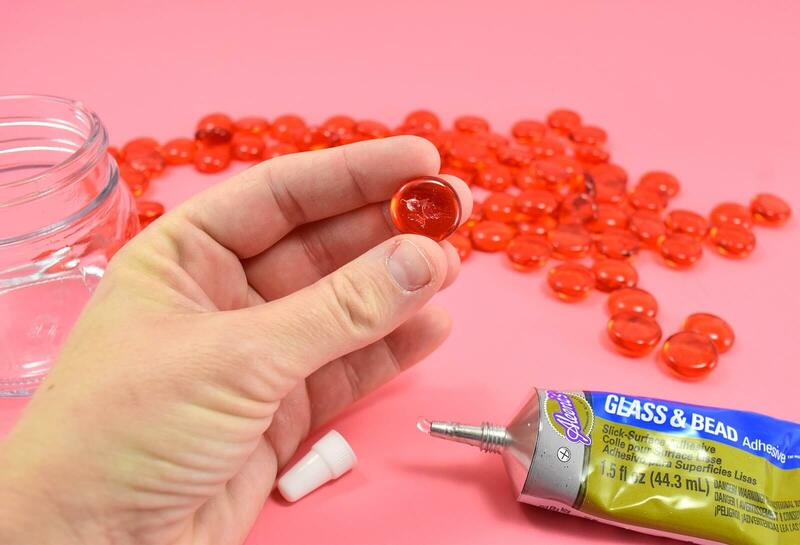 Apply a small amount of Glass & Bead adhesive to the backside (flat side) of your gem. 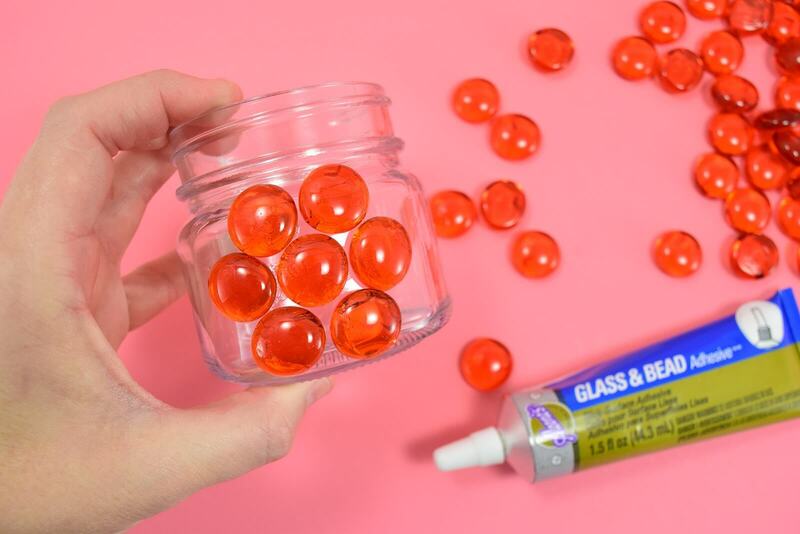 Straight out of the tube, this glue is pretty loose and if you go straight into using it you're going to have gems sliding all over your glass. To help combat this, place a few gems sticky side up and give a moment for the glue to begin setting, becoming tacky. Don't go crazy and set up a dozen gems at once, just a good 4-5 at a time is ample. Place the gems on the glass, holding the jar so that you are placing the gems straight down, from a birds-eye view, so that the gems have less help from gravity to slide off. Start with 3 gems in the middle, holding the jar in place for a few minutes (I just set mine on my lap and perused Pinterest for a few minutes) so that the adhesive can begin to set. 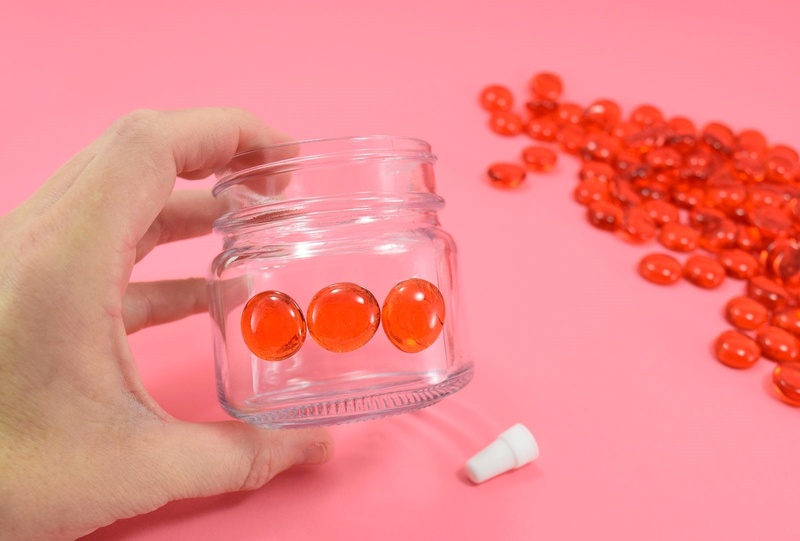 Once a slight push with your fingers doesn't affect the position of these 3 starting gems, it's time to get going, building around those 3 to fill the surface of the jar. Once you've got a good starting point, for me it was the flower shape in the picture above, use tape that isn't super sticky, like washi or painter's tape, and go all around the gems to keep them in place. Allow the stones at least an hour to set. Once set, we can start working a bit more at a time without worrying about the stones slipping off of the glass. 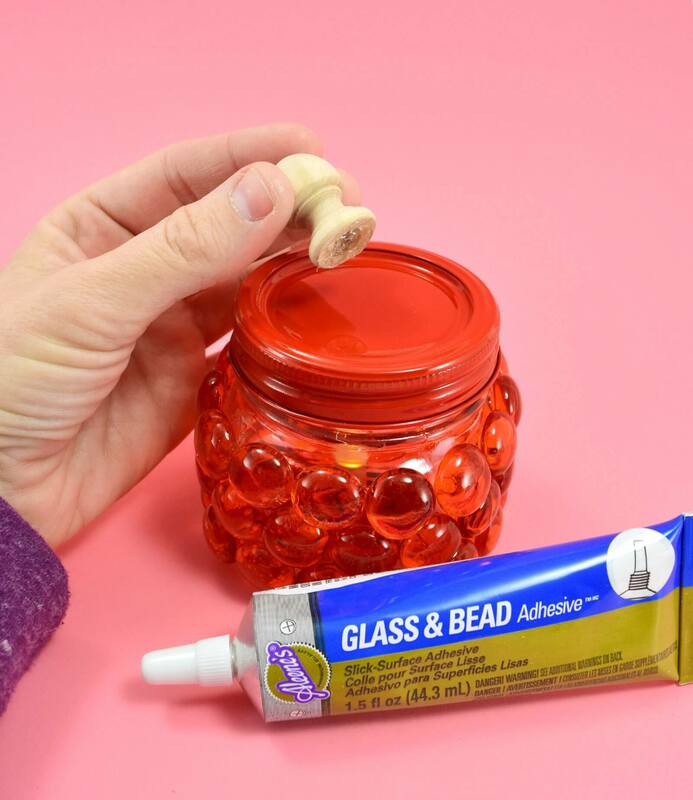 Turn your jar on its side so that your stones are near the bottom, placed on top of your work surface. Begin stacking your Glass & Bead covered gems onto the glass, using the stones beneath as support to hold them mostly in place. At a certain point, gravity is going to kick in and your beads are going to try to slip off, after all, glass is a slippery thing and I haven't quite figured out a way to keep gravity from doing its job. If necessary, feel free to add more tape to keep everything in place as it should be. Allow the adhesive at least an hour to set. 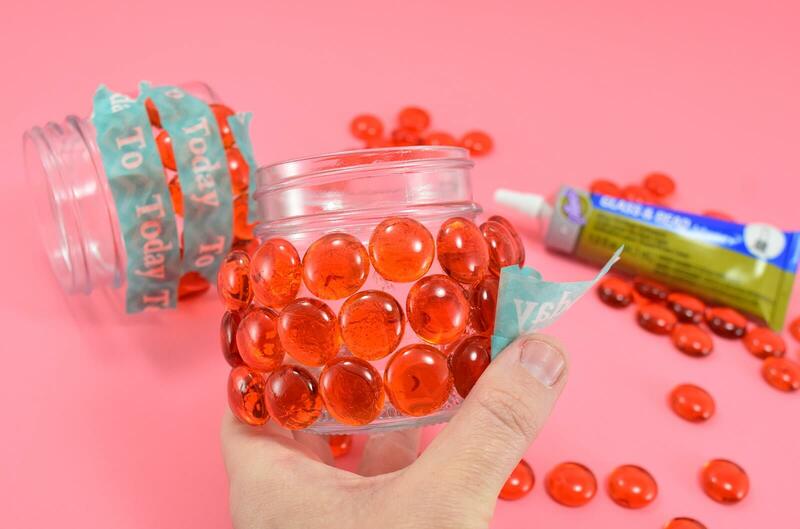 Continue adding gems around your jar until it is fully covered. Allow the mason jars to sit without being handled for at least 24 hours, though a few days would be best. While your jars are setting up it's a good time to tackle lids. 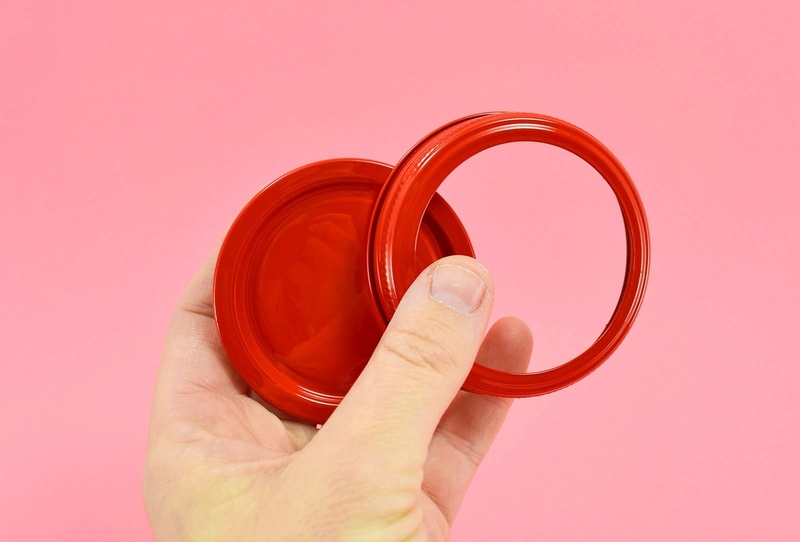 First hit your ring and seal with a spray primer and then apply as many coats of glossy, red spray paint as needed for an even, smooth finish. 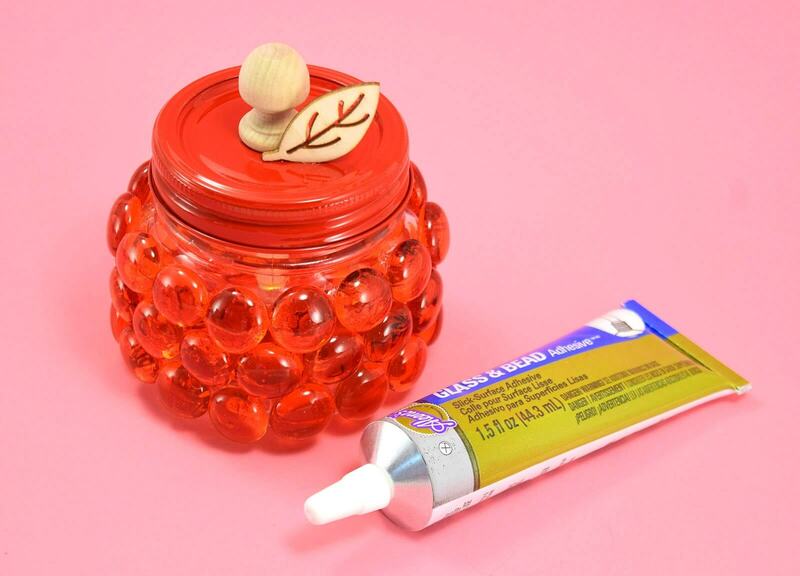 Apply a healthy dose of Glass & Bead adhesive to the inside of your dowel cap and along the edge. Allow a few minutes to get tacky and place in the center of your lid. This time gravity will work for us and should keep the dowel cap "stem" in place without any tape or assistance at all, yay! 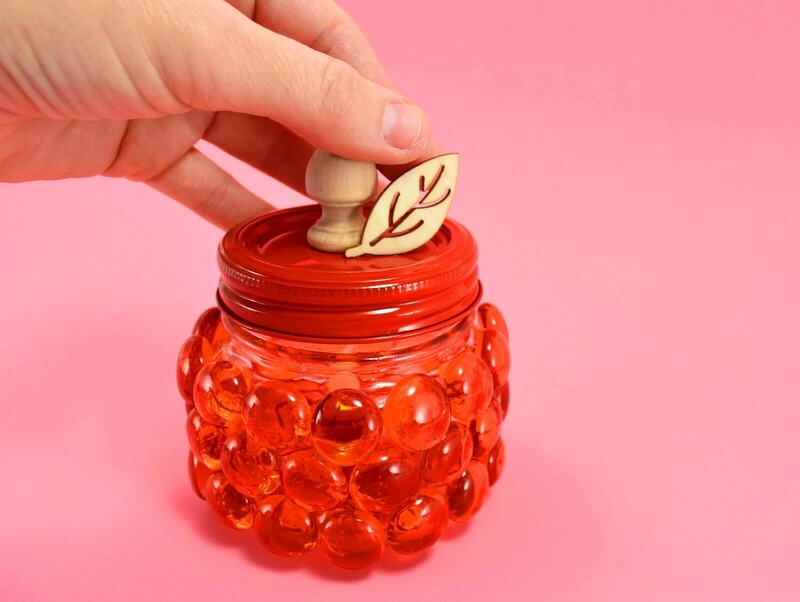 Place a laser cut leaf on your lid and figure out how you'd like the placement to be near the stem. Apply a trace amount of glue to the edge where it will touch the surface and allow a moment to become tacky. Set the leaf in place and hold for a few minutes until it can stand on its own. Allow the lid at least 24 hours to cure well. 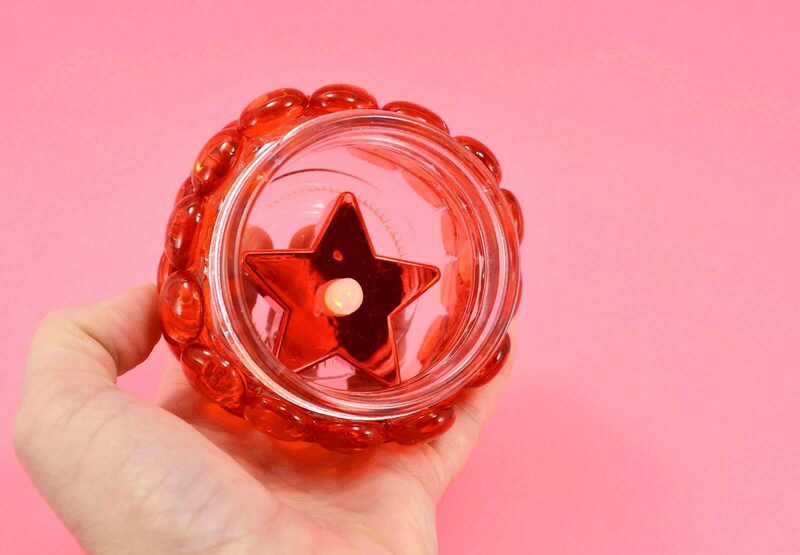 Add battery operated lighting to your jar and screw the lid in place. 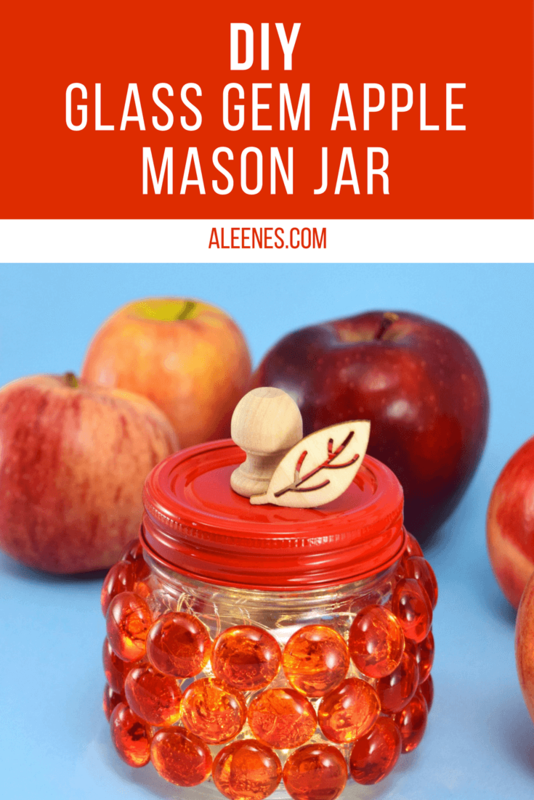 While it is a lengthy process with drying time, using Aleene's Glass & Bead Adhesive is the best option I have found when making gem covered mason jars and, in truth, I've made quite a few! 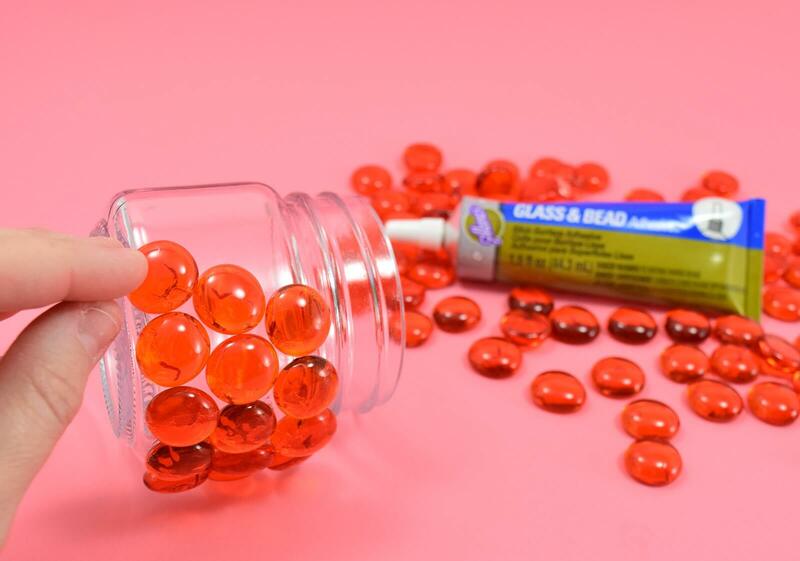 Once fully cured, this glue does not want to give the gems up for anything. Even when baked in the sun, day in and day out, for an entire summer with temperatures exceeding 100, my outdoor glass gem covered mason jars are still kicking without a single gem having fallen off. That's with getting knocked around being moved for the yard to be mowed and all of that jazz. 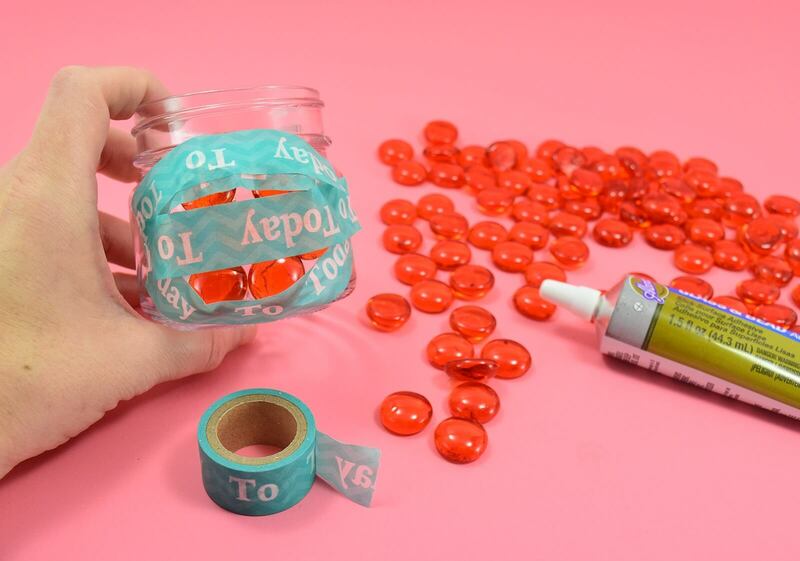 With the little bit of extra time it takes to use this adhesive over something quicker, you'll find that the longevity of your finished project immensely improved making the little bit of time at the start worth the effort! 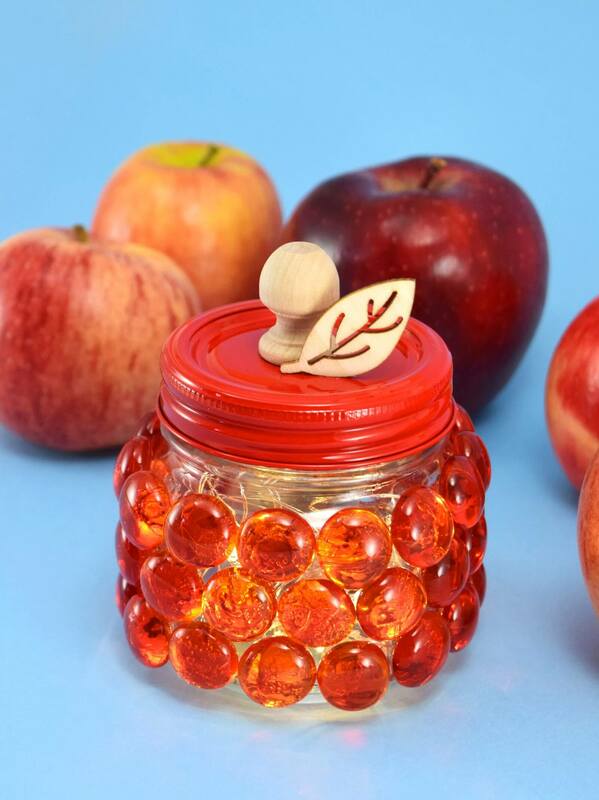 Add in the fact that these cuties look like my fave fall fruit, and this project is perfect to light up those cool, crisp Autumn nights! Her name is Allison, otherwise known as Auntie A or just plain ol’ “A” for short. 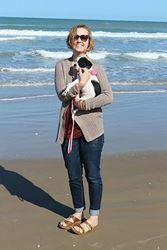 She likes to craft a lot and has taken up her own space on the internet to share her projects. She blogs about her loves and obsessions. If she doesn't love it, she leaves it.